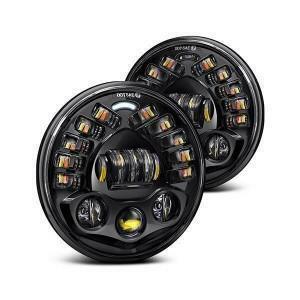 Our High Performance Alien 7" LED headlights are designed for use with Land Rover Defenders. Our Alien LED Headlights offer 3500lm (High Beam) /1400lm (Low Beam) and are easily adjusted using the standard Land Rover headlight adjustment bezels. Instantly upgrade the look of your Defender with our E Marked LED lights. Our Plug and Play design enables quick and easy installation to your Defender in place of the original sealed-beam headlights. Only minor wiring work is required for Halo/DRL operation. As it’s the first review I’ll make it as honest as possible, these headlights are awesome !!! They have fantastic field of view out to the sides, create an awesome fan of light infront on dipped beam and on full beam lights all the side bushes and overhanging trees very well and give every thing a true to daylight colour, most importantly they look absolutely mint ?? also love the way side lights fade in after use of the indercator ??? damn! Can defo recommend as an great upgrade and something a bit different to the halo which most people tend to do ?